It's a bright, mild autumn day. 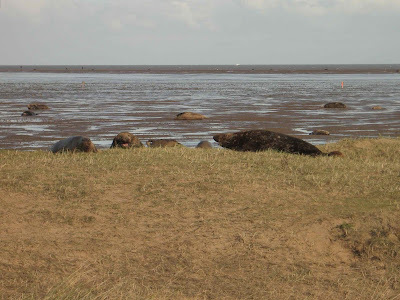 As planned, we set out for Donna Nook, the seal rookery in the Lincolnshire coast, near North Somercotes. We get there after getting to Horseshoe Point in mistake (flushing a pair of kestrels in the way) about 11:30. The colours of the autumn make this trip just worth it. 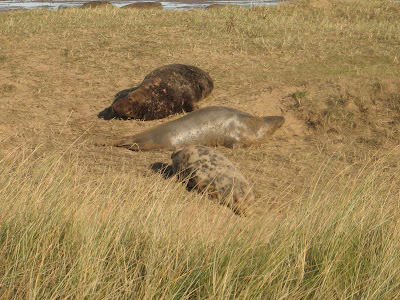 Donna Nook is a stretch of low-lying sandy coast on the south bank of the mouth of the Humber, with dunes covered in sea buckthorn and marshes. It is a RAF shooting range, but, apparently, operations do not seem to disturb the seals. 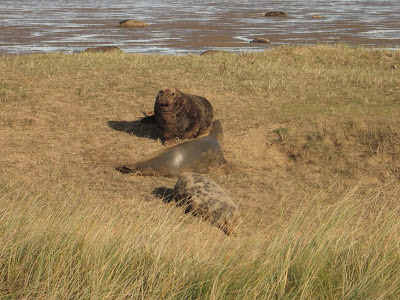 The area is protected as it is a grey seal breeding ground during November and December. There are lots of people today, the overflow car park is quite busy. We can hear the howling of the seals from behind the artificial sea wall, actually a barrier of sand covered in grasses and sea buckthorn. Their calls are high pitched, ululating cries such as ones somebody would make to scare you ooh,ooh ooh! There are many seals, scattered on the beach. The visibility is very good and we can see the Spurn lighthouse and the wind turbines of Easington in the low horizon on the north. 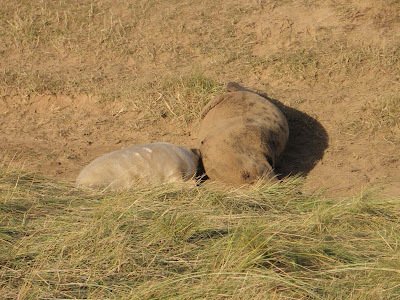 Two bulls threaten each other, open mouthed, on the dunes over a female. One of them approaches the female, but she threatens him and he stays put. The bulls have cuts and blood around their scarred necks. Bulls are larger than cows and tend to be darker, chocolate coloured, with lighter patches; cows are grey or tawny, with darker spots and blotches, although there is a lot of individual variation. Males and females have very different looking heads. Bulls have bigger muzzles and have a convex profile, the females have an almost flat profile, with a long muzzle. 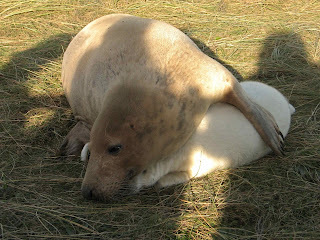 The pups are creamy white, skinny when newborn, but they turn quite round when a few days old (they are weaned at two to three weeks old, and after moulting their coats go to sea). We watched a female and her pup at close range. She nuzzled the pup and then rolled (ouch!) over him, seemingly keen for the pup to nurse, presenting him her belly and then scratching him when the pup reached for her muzzle. They also seem to play together, mock biting and scratching each other. Evidence of the births the previous night is clear. There are two afterbirths on the sand in the next photo. The rear of the females is still covered in blood and the newborn has its umbilical cord attached. 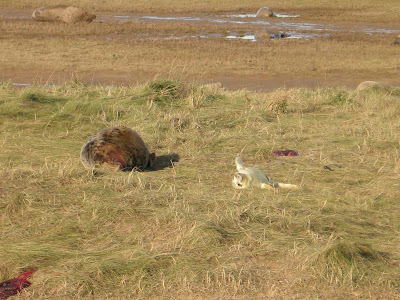 A dead pup on the beach, half eaten. A Magpie walking around looking for fragments of placenta. 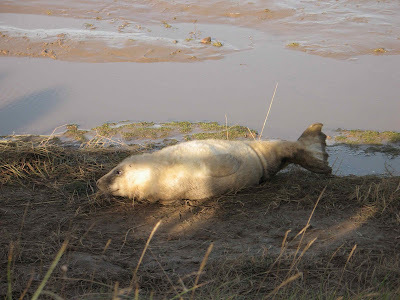 The Lincolnshire Wildlife Trust does a great job keeping the public behind a weak wooden (now double) fence, to reduce impact and contact with the seals, and there is up to date info in the warden's hut on the numbers of seals in the beach: 477 pups have been born so far this year (over a thousand last year). 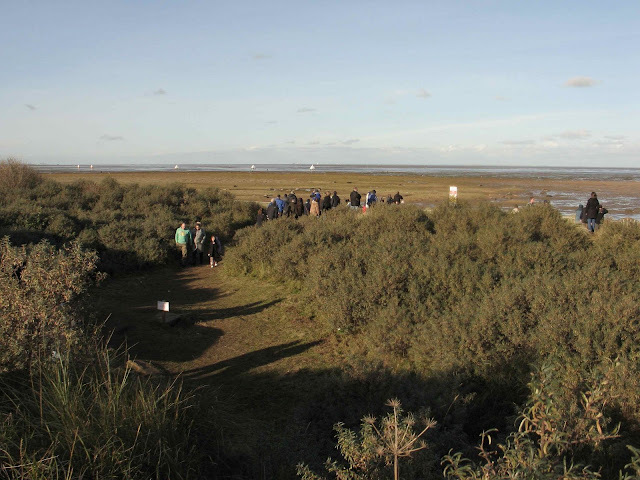 This is a UK wildlife safari at its best! 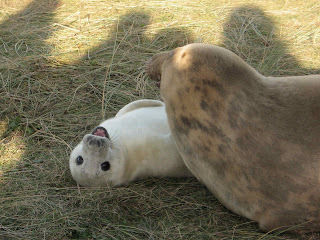 The following is from the Lincolnshire Wildlife Trust website, which contains maps and info on the reserve and the seals. 285 bulls, 673 cows, 477 pups. With an estimate of between 9,000 and 10,000 visitors over the weekend.